The 2016 Summer Olympics will be the first time that a team comprised entirely of refugees will compete together under the Olympic flag. The Executive Board of the International Olympic Committee announced on Friday that ten athletes had been selected to the Refugee Olympic Team. The group includes five South Sudanese distance runners trained by Olympian and former world record-holder Tegla Loroupe, two Syrian swimmers, two Congolese Judokas and an Ethiopian marathoner. “This will be a symbol of hope for all the refugees in our world, and will make the world better aware of the magnitude of this crisis. It is also a signal to the international community that refugees are our fellow human beings and are an enrichment to society. These refugee athletes will show the world that despite the unimaginable tragedies that they have faced, anyone can contribute to society through their talent, skills and strength of the human spirit,” IOC President Thomas Bach said in a press release. The ten athletes were selected from a pool of 43 candidates. They will live in the Olympic Village alongside athletes from all other nations and will compete under the Olympic flag. Should any of them win gold, the Olympic anthem will be played. Meet the ten refugee athletes that are headed to Rio. Before the war in Syria, Mardini represented her home country in international competition. Originally from Damascus, Mardini fled to Germany in 2015 with her sister at the age of 17. Along the way, Mardini had to cross the Aegean Sea to get from Turkey to Greece. The boat that she and her sister were on had an engine failure a few miles from the Greek shore, and Mardini had to swim for more than three hours to help pull the boat to land. Mardini will compete in the 100 meter freestyle. Anis was 20 years old and eligible for military service when war broke out in his native Syria. Already an international swimmer with a budding career, Anis and his family left Syria to join his brother in Istanbul in 2011 before moving to Belgium in 2015. Anis will be competing in the 100 meter butterfly. Biel and his family arrived in Kenya’s Kakuma Refugee Camp in 2005 after fleeing war in South Sudan. Last year he was selected to train with Loroupe after a trial in the camp. The 21 year old has been with the coach ever since. Biel will be competing in the 800 meter run. Chiengjiek’s father was a soldier who died in 1999 fighting in the Sudanese war. Chiengjiek fled his home in 2002 before he could be selected to fight in the same war. Like Biel, he arrived in the Kakuma Refugee Camp before being selected to train with Tegla Loroupe. Chiengjiek will be competing in the 400 meter dash. Lohalith fled war in South Sudan with her aunt as a child, arriving in the Kakuma Refugee Camp in 2002. In 2015 she tried out for the Tegla Loroupe training group after being encouraged by a high school teacher. She’s been training with Loroupe ever since. Lohalith will be competing in the 1500 meter run. Like the other South Sudanese refugees, Lokonyen arrived in the Kakuma Refugee Camp in 2002 after fleeing war as a child. She was selected to train with Tegla Loroupe in 2015 after performing well in the same trial as Lohalith. Lokonyen will be competing in the 800 meter run. Once a cattle herder for his family in South Sudan, Lokoro arrived at the Kakuma Refugee Camp in 2004 after fleeing war. He was selected to train with the Tegla Loroupe group in 2015. Lokoro will compete in the 1500 meter run. 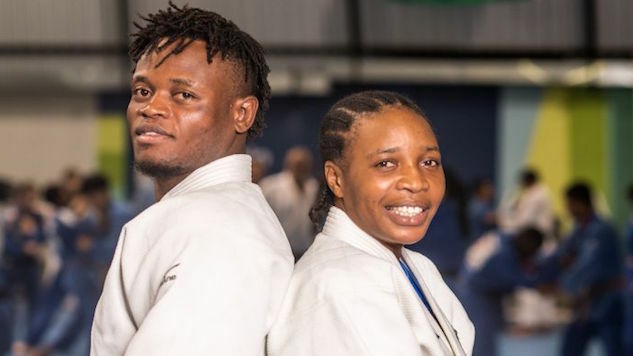 A professional Judoka who has represented the Democratic Republic of Congo in the past, Mabika has lived in Brazil since 2013 after being granted asylum. She is a native of Bukavu, the region that was hardest hit during the DRC’s civil war. “Judo is my life. It helped me escape war, to take another path,” Mabika told The Guardian in January. Mabika will compete in the 70 kilogram weight class. Also originally from Bukava, Misenga trained with Mabika and represented the Democratic Republic of Congo in international competition. Misenga decided to flee the DRC after his mother was killed and his brother went missing. In 2013 he was granted asylum in Brazil and has continued to train with Mabika there. Misenga will compete in the 90 kilogram weight class. After leaving Ethiopia because of political problems, Kinde has been living under protection in Luxembourg since 2013. He hit the qualifying standard for the marathon in the 2015 Frankfurt Marathon. Kinde will be competing in the marathon.